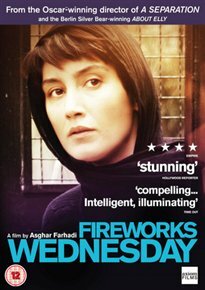 An engrossing portrait of three marriages set against the backdrop of the Persian New Year. The story begins with Rouhi (Taraneh Alidoosti), a young bride-to-be who takes a temporary job cleaning for a family in northern Tehran. Upon arriving at the apartment she finds herself in the middle of an explosive domestic conflict between Mojdeh (Hedyeh Tehrani) and her husband Morteza (Hamid Farokh-Nejad). Mojdeh suspects that Morteza is cheating on her with the next door neighbour, Simin (Pantea Bahram), a woman who set up an illegal beauty salon in her apartment after her own marriage broke up. Over the course of the day, the young woman, the sparring couple, their small son, the wife’s sister and husband, and the beautician engage in a series of exchanges, confrontations, and prevarications as the truth unfolds.